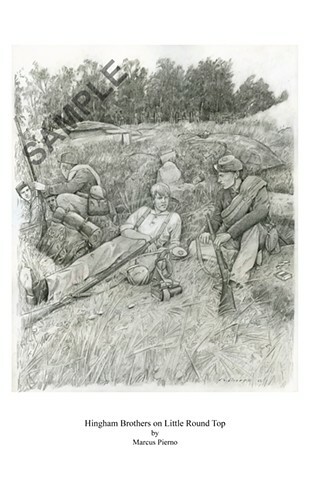 Limited Edition Print of "Hingham Brothers on Little Round Top"
This drawing depicts a chance encounter between John and William Breen-two brothers from separate Union regiments during the Battle of Gettysburg in the American Civil War. As the fighting on Little Round Top drew to a close towards the evening of July 2, 1863, the 32nd Massachusetts Regiment formed part of a relief force for the worn out men who had fiercely defended the hill for hours. As the 32nd began building entrenchments and finding cover from the threat of enemy sniper fire, an exhausted William Breen (reclined in shirtsleeves) noticed a familiar face. William's brother John from the 9th Massachusetts had braved the dangerous ground to pay him a visit. Amidst all the tension and horrors of the day, this must have been a pleasant respite for both William and John. Perhaps they even forgot for a moment where they were and felt like they were back in Hingham, MA. This is based on an actual occurrence and was commissioned by a descendant of the two men. In order to get the details right, I researched the proper uniforms and equipment, and even took a trip to the actual location. Since original photographs of either brother have never been located by the family, I had only physical descriptions on which to base my interpretation of how they might have appeared. I also utilized descriptions from the one brother who survived the war (William), recounted many years later in a newspaper article.